While browsing through the news this week one story caught our eye and captured our imaginations – an article about the innovative new drinking fountain designed by Poietic Studio – which they call the Tropism Well. The design is certainly unlike any drinking fountain we have ever seen, and it makes use of the “natural laws of physics to function”, according to design team Richard Harvey and Keivor Stainer. 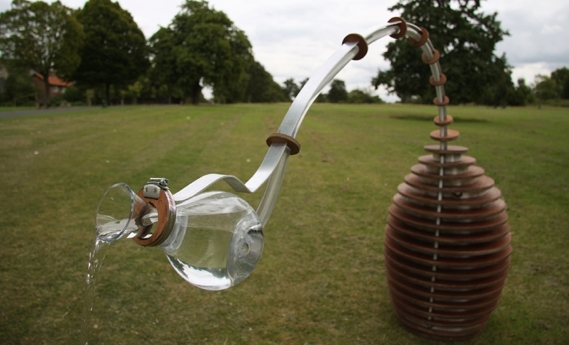 “Once it has seen you, the gently bowing motion is created simply by moving water up and down the stem.” This gives the user a unique and interactive experience of having their water poured out of a jug attached to the fountain, straight into their glass, by the strangely life-like fountain. Poietic Studio say the installation aims to open up new discussions about the way in which water is distributed in public spaces. Judging from this sculptural installation we can be exited about some of the interesting possibilities for the future of the drinking fountain in public spaces. Poietic Studio aims to use their expertise in art, design and engineering to create unique and tangible experiences. Read more on the Tropism Well on their website.